From frozen deep fry at 350ºF for 6-8 minutes or until golden brown. 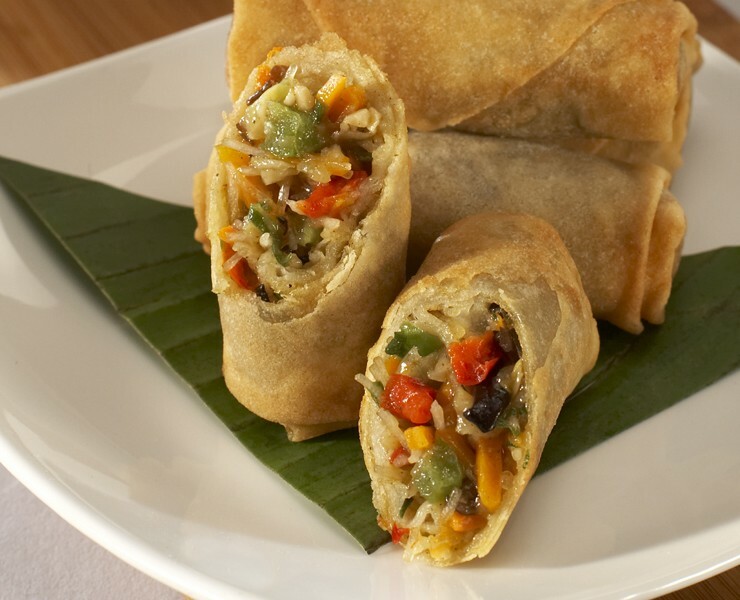 A spicy blend of smoked chicken, Monterey Jack cheese, peppers and fresh cilantro rolled in a flour tortilla trumpet. A flaky triangle phyllo pastry filled with spinach, zesty feta cheese and tantalizing spices. A delicate marriage of tender chicken breast and mushroom duxelle wrapped in a French-style pastry. Tri-color cheese tortellini, marinated roasted tomato, Kalamata olives and Prosciutto ham are hand-threaded on a 6" skewer for a colorful and flavorful beginning to any meal. Miniature beef frankfurters wrapped in a blanket of puff pastry. Brie cheese blended with raspberry preserves wrapped in a flaky puff pastry. Tender strips of chicken breast marinated in sesame oil and coated with sesame seeds and Japanese bread crumbs. Our spicy chicken complemented by cheddar cheese, jalapenos and Mexican spices folded in a corn masa pastry.